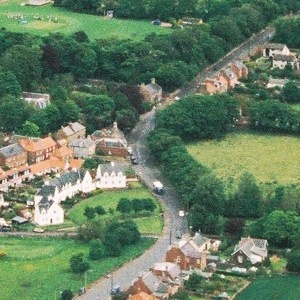 From the Beltonford roundabout, the A1087 runs between fields until it reaches a hump-backed bridge over the Biel Burn, the entrance to West Barns. Notice the brick-built houses on your right as you approach the bridge, just after the 30 mph speed limit sign. They are all that is left of once-important industries powered by the water of the Biel -- paper, bricks and tiles, and beer. Famous racehorses were bred here, and there is still a stable. 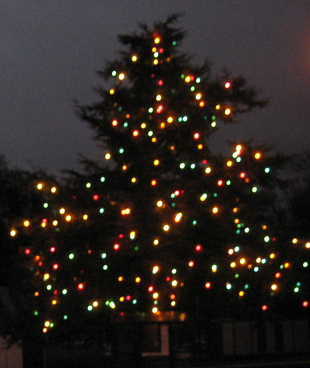 By the bus stop on the village green, outside the inn, a tall blue cedar tree is a wonderful site in midwinter, covered in coloured lights. It was planted in 1935 for the Silver Jubilee of King George V and Queen Mary. 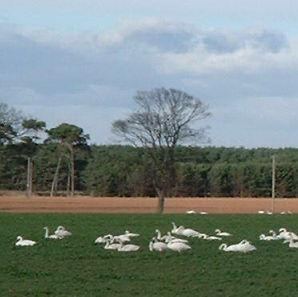 Travelling on, beware of traffic lights; then pass the West Barns Bowling Club, a pond (once an important part of the Seafield Brick and Tile works) and a caravan site among trees on the north (seaward) side of the road, with West Barns Primary School and the distinctive white house called Battleblent on the higher ground to the south. At last you are in Belhaven. At the crossroads the A1087 starts to rise; it's now Belhaven High Street - not to be confused with 'the High Street' which is in Dunbar. Beveridge Row runs south from the crossroads to the Hospital (small, mostly geriatric, with a ward for the use of the local doctors; you have to go to Edinburgh for serious accident and emergency treatment). 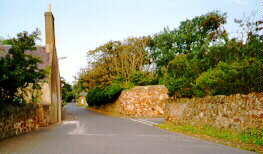 Higher up the hill Brewery Lane runs south to part of the famous Belhaven Brewery (which often welcomes visitors). 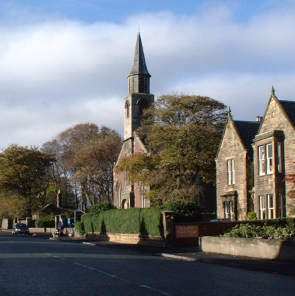 Halfway up the hill you'll find the Mason's Arms pub, and Belhaven Parish Church is at the top. Opposite the church, Summerfield Road goes past Dunbar Grammar School on the left, with a small shop where you can get rolls and newspapers on the right. Down the hill beyond the shop, a road to the right takes you into an area known as "the Trees" because each street has the name of a tree. You can get back to Brewery Lane from here. 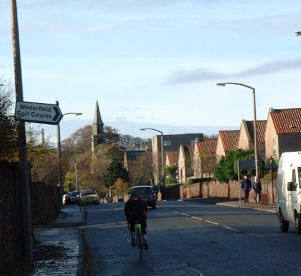 The main road carries on to the centre of Dunbar, changing its name from High Street to Belhaven Road. 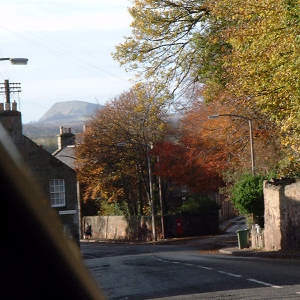 Returning to Belhaven you can see Traprain Law in the distance as you go down the hill towards the junction with Duke Street. 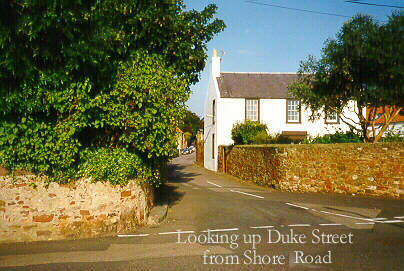 Note that there is another Duke Street in West Barns. 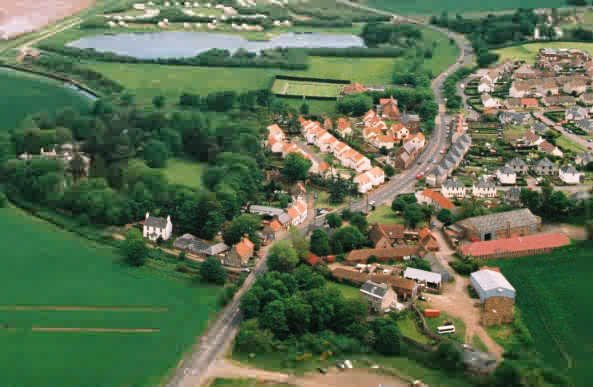 The old village of Belhaven also includes, to the north, Shore Road, North Street, and Back Road. 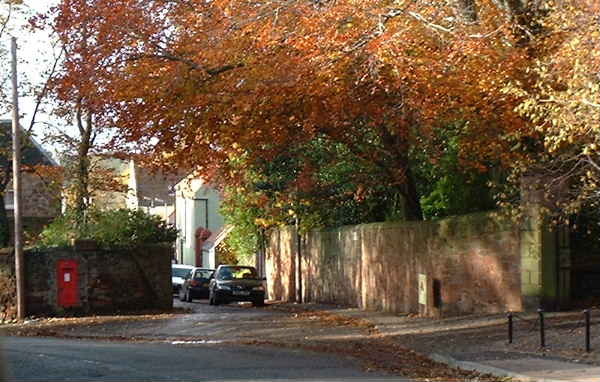 The sandstone boundary walls are a colourful feature of the district. The railway line between London and Edinburgh runs close to the hospital. 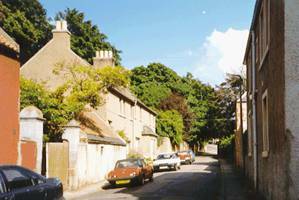 Built in 1846, the line stopped Dunbar town sprawling over the woods and fields until recently.